By the evening of Nov. 8, smoke from the Butte County Camp Fire had traveled 160 miles southwest and blanketed City College. By night, the U.S. Environmental Protection Agency radar Air Now deemed San Francisco air unhealthy. As it remained that way over the following week, colleges such as San Francisco State University and Skyline College closed their doors by Nov. 14. When City College emailed its community on the mornings of Nov. 9 and 15 stating that it would remain open, some questioned the decision. “I feel like they should have stopped [class] then and there just for the people who have asthma or bronchitis or anything wrong with their lungs,” said Lonnie Jordan, a City College student who has asthma. The challenge — coping with unhealthful levels of air pollution, and deciding whether to stay open — was a new one for City College. 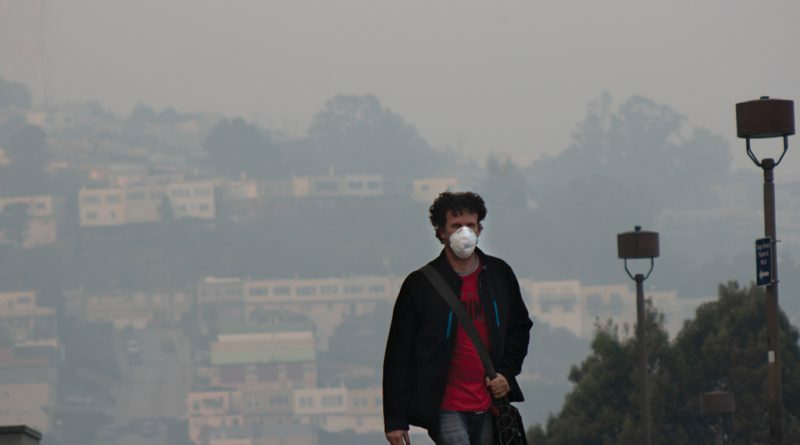 By 2 p.m. on Nov. 15, Air Now labeled San Francisco air very unhealthy. Within 50 minutes, City College emailed its community, stating it would close at 3:30 p.m.
City College physics lab manager Tom Dodge leaves Science Building after school closes on November 15, 2018 due to air pollution. Photo by Peter J. Suter/The Guardsman. City College coordinated its decision to stay open with the San Francisco Unified School District and the City of San Francisco. It was on air quality alert, bringing activities indoors when possible, monitoring individuals with health conditions such as asthma, and having coaches cancel practices and games as necessary. The college stated it would allow those affected by the fire to be accommodated if they could not attend school. Studies have linked particle pollution to premature death for people with heart or lung disease, according to an EPA web page. The pollution is also linked to nonfatal heart attacks, irregular heartbeats, aggravated asthma, decreased lung functions and increased respiratory symptoms. Jim Connors, the interim chair of the Department of Administration of Justice and Fire Science, said that the Camp Fire smoke may also result in new problems. Nonetheless, an EPA release for schools does not mention canceling classes. It instead advises that people in unhealthy air take more breaks, reduce intense activities, and move their longer or more intense activities indoors. Connors said he felt that the City College did a good job addressing any potential issues, referencing the precautions it had taken. 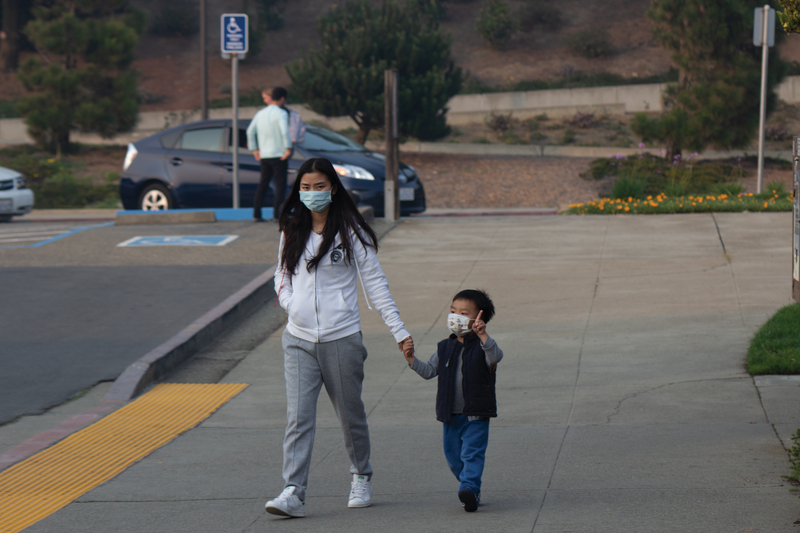 The college also provided around 400 air filtration masks at its Health Center before running out on Nov. 15. 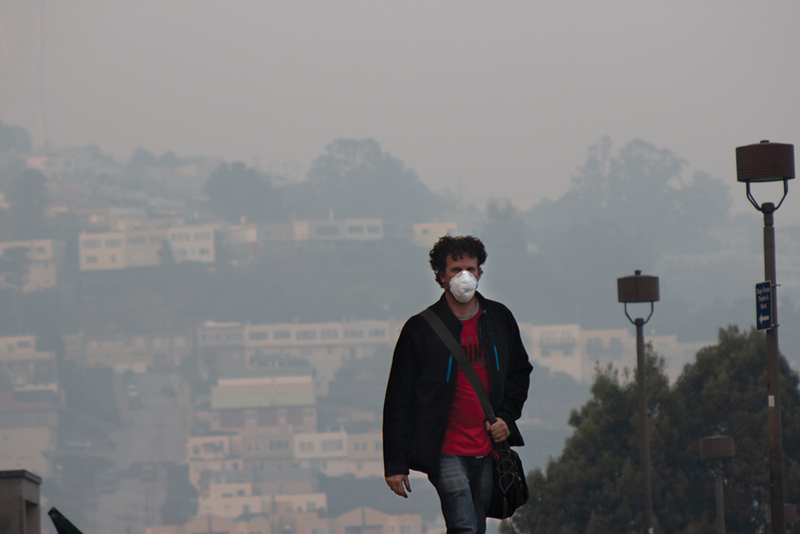 University of San Francisco Director of Public Safety Dan Lawson said that USF met three times a day to monitor its air quality. He said he expected City College was doing similarly. While some in the college community such as Jordan felt the college should have closed sooner rather than later, others showed concern firstmost for those who rely on college services. “I feel they should have closed the college, personally, because I have asthma,” Wanda Wilson said. Wilson is a clerk at the Ocean Campus Child Development Center, which cares for toddlers and children whose parents qualify for child care assistance. “But from the parents’ point of view, I’d rather for it to be open so they can have child care, and not have to figure out what to do with their kids if they go to work,” Wilson said. On the morning of Nov. 15, the childcare center’s windows and doors were shut, and the fans were on. Fay, a parent who declined to give her last name, was dropping off her 3-year-old daughter. City College’s older adults were another demographic of the school community also uniquely reliant on school services. “Things are so different now, with many of us older faculty and students taking public transportation and seeing the tragedy of our senior population,” stated Judy Hubbell, a faculty at City College’s Older Adults Program. Hubbell suggested that in the event of future emergencies, the college should better connect to its aging population, many of whom do not use the internet. “We see the homeless and the dependence on others. We see in our classes the differential in health and fitness that our classes provide,” Hubbell said. And while the San Francisco Department of Public Health advised staying indoors, those experiencing homelessness could do little to take that advice. “I know two people that are staying in shelters that are concerned that they have to leave during the day,” said Maraea Natua Master, the college’s program coordinator of Homeless At-Risk Transitional Services. She said the San Francisco Public Library, St. Anthony’s in the Tenderloin and the San Francisco Homeless Outreach Team were resources that could be utilized by those experiencing homelessness. Another group who remained outside for extended periods were custodians, who had been offered particulate filtration masks by their boss, student custodian Alex Hernandez said. But he added that he felt the air quality was the same indoors as outside, with the exception of the Wellness Center, one of the college’s newest buildings. His concern echoed that of Lawson. Even at the relatively new Wellness Center, physical education instructor Coni Staff had to cancel her badminton class after 30 minutes on Nov. 9. Following two cancellations of the women’s soccer coast championship due to air quality, conference officials decided that the two top teams would not play. As a result, the Rams women’s soccer team took second place to Cañada College by a 1-point deficit in the rankings. Women’s Soccer Coach Jeff Wilson added on Nov. 15 that the team had not been able to to train outside. The Fashion Direction and Coordination class lost time to prepare for their Dec. 5 show. The class canceled it, feeling unable to do its best work with the closures happening close to the show, Professor Natalie Smith said. The facilities department did not reply to a request for comment about facilities’ air filtration.